What Are the Most Common Snakes to Find in Maryland? There are many types of snakes found all across the United States, and the types of individual snakes vary from state-to-state. For example, snakes such as rattlesnakes are commonly found in the Southwest United States but are not common in the eastern or northern portions of the country. In Maryland alone there are an abundance of snake species, but a few species are found more commonly than others. The most common snake in Maryland, as is the case with many other states, is the garter snake. While most people are aware that garter snakes are not dangerous to humans, they do actually have a mild amount of venom. They rarely grow larger than two feet in length and are generally small and do not cause much of a nuisance to humans. Garter snakes also range in color from brown to black, and can be easily identified by the noticeable stripe which runs down their back. Garter snakes are commonly found by bodies of water, making lakes, rivers and other wet areas common spots for the species. Another common species of snake in Maryland is the rat snake, which is also not dangerous to humans. As per their name, rat snakes are competent hunters which help control the population of mice and rats, making them beneficial to humans. They are not venomous as well, but a run in with a rat snake may still be scary due to their size, as the animals can grow to over six feet in length. One Maryland snake that humans should stay clear of is the ringneck snake. Unlike most common snakes in the area, ringneck snakes are in fact venomous. They do not commonly bite, and the small levels of venom are only released through saliva. As long as you do not handle the ringneck snake, there should be nothing to worry about in terms of personal safety. The other most common Maryland snake is the northern brown snake, which is also not venomous. These snakes mostly hunt at night, so they are spotted less often than daytime snakes. Nonetheless, the northern brown snake is more likely to run away or flatten itself in fear than attack if found. They are also about one foot in length, making the northern brown snake a small and mostly harmless species. If you notice snakes near or on your property, call the experts at Shumaker Animal Control to deal with the problem for you. 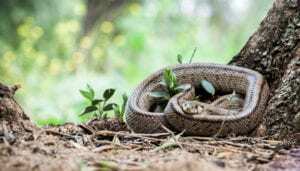 Our experienced team will take care of the problem in a timely manner, ensuring that you are not harmed by any snakes, which can respond aggressively when threatened. Call us at 443-854-8072 or visit our website for more information. This entry was posted on Tuesday, January 15th, 2019	at 8:13 pm	. You can follow any responses to this entry through the RSS 2.0	feed. Both comments and pings are currently closed.